One of the new plants we are growing this year is Cowslip. Cowslip ( Primula Veris ) is a relative of the primrose, and one of the earlier spring flowering plants. They are native to the UK and most of Europe, however due to the intensification of agriculture, numbers in the wild have declined . They do still survive in hedgerows, open woodland and lane verges. Cowslips have rosettes of green, crinkly, tongue-like leaves low to the ground. Tube-like, egg-yolk yellow flowers are clustered together at the ends of tall, green stems. Ideal for planting in wildlife areas of gardens, where given the right conditions, they may spring up from seed where they will. This will be aided by leaving the land undisturbed during the growing and flowering season. 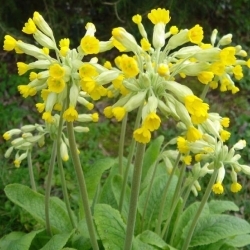 Cowslips seem to prefer alkaline to slightly acid soil and need plenty light and a moist soil. They are pollinated by insects and are an important source of nectar for bees and many other insects. Roots and flowers of cowslip are used for herbal medicine. Conditions treated include headaches, insomnia, nerve pain skin conditions and coughs and colds.